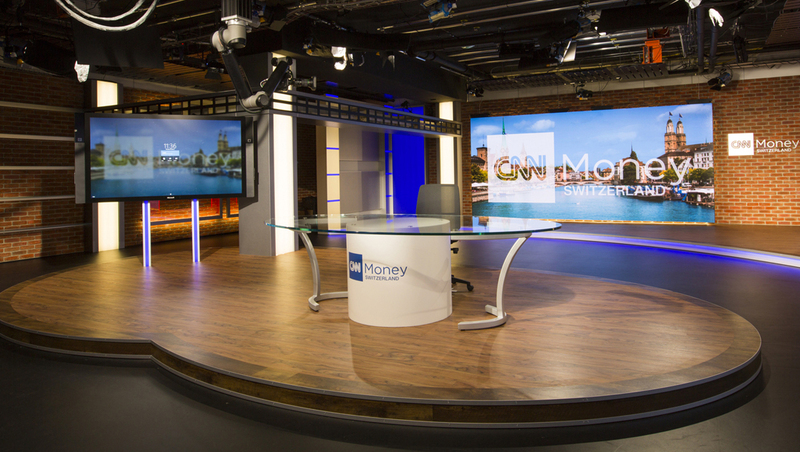 CNN Money Switzerland launched Wednesday, Jan. 24, 2018, from a new set that blends a plethora of LED video panels with more traditional textural surfaces. CNN Money Switzerland is a business-oriented English language network that is a joint venture between MediaGo and CNN. Designed by Z Space Creative, the center of the studio space features an oval glass anchor desk with a cylindrical base and two metallic support structures, all of which sits atop of a wide, wood-toned riser. Directly behind the desk is a large seamless video wall, which can be used as both an anchor backdrop and standup location. The space also includes three pivoting LED panels that can be used for blended topical or branded graphics, as well as being used in conjunction with the adjoining video wall. In addition, a control room loop can also be used as a sort of virtual set extension, with the ultimate effect of making the space seem larger. Wrapping around this area are sleek metal toned panels with an end cap featuring internally lit reveal lines. Interspersed with the metallic surfaces is faux brick, including a section with a dramatically lit dimensional logo. To the other side of the video wall, wide, internally lit columns frame additional walls featuring a blend of brick, metal, a gray textural surface and accent lighting with an LED video ribbon wrapping around the top. Near one of the lighted columns is a freestanding video panel that, like the other tech on the set, can be shot from both the anchor desk and as a standup venue — as well as appearing in wide and toss-style shots.